Forces fighting to topple President Bashar Assad advance on the country's largest city. BEIRUT — An Islamist faction of Syrian rebels captured an infantry base in the northern city of Aleppo, its fighters said Sunday, as forces fighting to topple President Bashar Assad advanced on the country’s largest city. Also Sunday, Syrian warplanes blasted a Palestinian refugee camp near Damascus, killing eight people and wounding dozens, activists said. Some Palestinian groups in the Yarmouk camp have been backing Assad’s regime. The base was the second major army installation taken by rebels in a week in Aleppo. Its fall is the latest blow to the Assad regime. A statement by the al-Tawheed Brigade said the rebels “fully liberated” the military facility in Aleppo on Saturday. It was posted on al-Tawheed’s official website Sunday and said the Islamist rebel brigade’s commander was killed in the battle. The Al-Tawheed Brigade is one of the largest rebel groups operating in Aleppo, Syria’s largest city, which has been a major front in the civil war since July. One of the videos posted on the group’s website shows the body of a man the narrator says is “the hero and martyr who was killed on the day of liberating the infantry school,” apparently the Al-Tawheed commander, Col. Youssef al-Jader. A boy said to be the commander’s son is seen crying as he leans over the dead man. Another video shows several rebels praying at the captured base. Armed fighters are also seen walking around the infantry school with slogans “Assad Forever” and pictures of Assad and his late father, Hafez, hanging on the walls. The Assad family has ruled Syria with an iron fist for more than 40 years. In a related development, Egypt said Sunday that it has evacuated more than 4,000 of its nationals from Syria over the past few months. The Cairo Foreign Ministry statement did not give further details. Egypt’s national airline halted flights to and from Syria last month because of the deteriorating security situation. The uprising started in March 2011 as peaceful protests but quickly turned into a civil war after the government’s brutal crackdown on dissent. Activists say more than 40,000 people have been killed in almost 21 months of conflict that has increasingly sectarian overtones. 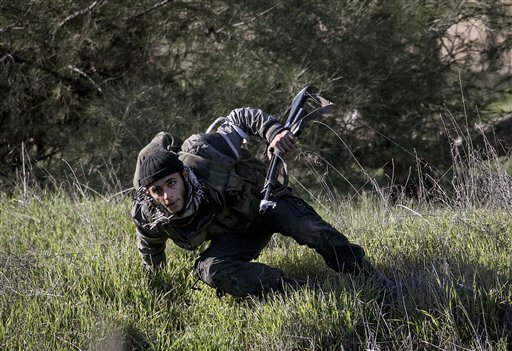 The opposition fighters mostly come from Syria’s majority Sunni Muslim community. Assad’s regime is dominated by members of the Alawite sect, an offshoot of Shiite Islam. Eight people were killed in the airstrike on Yarmouk, the Observatory said, and dozens were wounded. At least three people were killed in the clashes between rebels and gunmen loyal to Assad that followed the air strike, said Rami Abdul-Rahman, the Observatory’s president. The Palestinians are divided over the crisis in Syria. When the unrest began in March 2011, the half-million-strong community tried to stay on the sidelines. But in recent months, many Palestinians started supporting the uprising, although most insisted the opposition to the regime should be peaceful. A Yarmouk resident told The Associated Press that the clashes between rebels and PFLP-GC gunmen flared up on Friday when rebels tried to take over the PFLP-GC’s headquarters in Yarmouk. He said the rebels have taken positions all over Yarmouk, a densely populated area in southern Damascus, shooting at government buildings and police outposts held by PFLP-GC gunmen. The resident, who observed the fighting from the edge of the camp, spoke on condition of anonymity for fear of reprisals. The videos appear consistent with AP’s reporting from the area. “We condemn in the strongest terms the crime of Assad’s regime in Yarmouk refugee camp, and call on all international parties, including the states that still back this regime, to act immediately and stop these massacres against Syrians and Palestinians in Syria,” PLO official Yasser Abed Rabbo told the AP. Anwar Rajja, a Damascus-based spokesman for the PFLP-GC told the AP that several civilians and the group’s fighters were killed and injured in the Yarmouk fighting. He said his group is fighting “terrorists,” who have come to the camp from the front lines in the suburbs of Damascus. The areas have been opposition strongholds since the beginning of the uprising. The Syrian regime and state media refer to the rebels as terrorists.